To The American People, We The People! I filed a civil lawsuit against a criminal enterprise operating from the office of the President in September 2013 case # 4:13-cv-00054JLK. Only an aggrieved Private Citizen has the law and standing behind them to prosecute such a case. I would not have brought this case unless I believed I can prove it. This Racketeering Enterprise was, and is an act of “TREASON”. It was established with the Agricultural Reorganization Act of 1994. This legislation was driven by; then Vice President Al Gore, former President William Jefferson Clinton, then Senator Joe Biden and Senator Patrick J. Leahy, Congressmen Kika De La Garza, and Jack Brooks. It had additional support from many other legislators most notably congressmen John Conyers and Senators Chuck Grassley. Multiple class action discrimination settlements totaling 4.4 billion dollars including Piggford I an II followed the enactment of this legislation, these were false flag cries of discrimination, justification for, pay off, this legislation, and Presidential vote getters.A testament to the fact this was a war on farmers and not about racial discrimination is that to date every racial ethnic group has filed suit for discrimination although, white farmers were denied grounds for discrimination. Additionally, their numerous accounts of legislators, lawyers, etc claiming there was no discrimination. This is not about discrimination it’s a secret unconstitutional criminal war on farmers. Andrew Brietbart called the Piggford settlements the greatest fraud ever perpetrated on the American people. I don’t know? If he ever knew? The real fraud wasn’t the payoffs, but, the treason committed on the American Farmer and the Constitution of the United States with the enactment of this legislation. 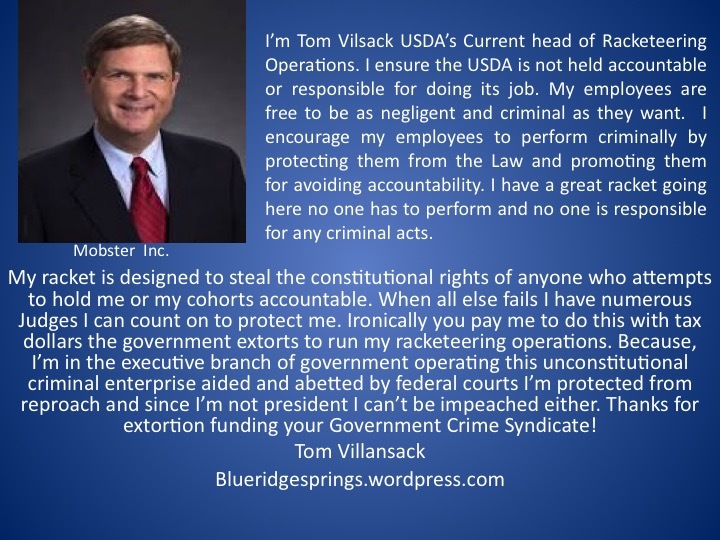 The Federal Courts criminally and corruptly dismissed this racketeering case. The Fourth Circuit Court of appeals gave this corruption a wink and a nod case #’s 14-1480, 14-1925. I filed a writ of certiorari with the Supreme Court petition 14- 1051 on February 27, 2015. (“It is not for us to determine, and we have never presumed to determine, how much of the purely executive powers of government must be within the full control of the President. The Constitution prescribes that they all are”). Serious Question America does this imply the Supreme Court views the President as having power to violate the supreme law of the land? Power to War against the Constitution? To war against We The People? Yes, I know exactly how you feel Judge Thomas Enough is Enough! This racketeering enterprise destroyed my life, no process has ever been so debilitating, I never asked for this role, but this is not what America is all about. I’m a victim of a Government run criminal enterprise, this enterprise has destroyed my life’s work. My name, integrity,character have all been harmed, my family my friends have been harmed. April 2015 I wrote the President of the United States requesting he perform his sworn duty under Article 2 Clause 3 to uphold the laws and the Constitution of the United States. He has never responded to this letter in any manner. He is in fact pursuing ever-greater expansive policies to further the goals of this criminal enterprise with the EPA, BLM, and USDA.See Mr. President all thats necessary for the triumph of Government evil is for those in power to do nothing! The Democratic Establishment is abusing in a war on the people and the constitution the judicial doctrines of Chevron, Seminole Rock, and Auer Deference in a war for green growth, smart growth, sustainable, and save the planet plans limiting the use and ownership of private property, and, in many cases, leading to the confiscation (Taking) of personal property and its return to wilderness.” A plan born from Al Gore’s commitment to UN Agenda 21 ,at a UN conference in Rio De Janeiro in 1992, and a prime objective of the Racketeering enterprise on which the lawsuit was based. November 2016 I filed a lawsuit in the court of Federal Claims, “The so called Conscience of the Nation” because the Judiciary criminally dismissed my racketeering charges, broke a promise to the American People, and to me, a contract offer to a private citizen to become a prosecutor to prosecute just such a criminal enterprise operating within a legitimate government. The Judge Assigned to this case # 1:15-cv-01344EJD was Edward J. Damich appointed to the bench by none other than William Jefferson Clinton and who’s employment record indicates he may well have been the chief legal risk management architect for the implementation of this criminal, unconstitutional, treasonous, racketeering enterprise between 1993,1994. February 4, 2016 Judge Edward J. Damich declined to attest to abide by his oath of office. 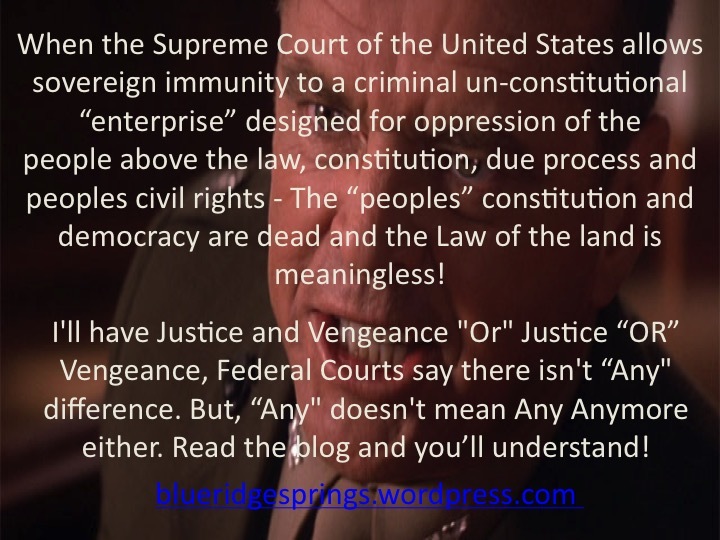 See his written opinion here> What honor does a Judge have who to affirm his oath of office. Whitman v. United States, 574 U.S. ___ (November 10, 2014). I also suggest you consider these in relation to the Obama administrations EPA efforts on Coal, and Water as well as BLM activities in Texas. March 10, 2016 Judge Edward J. Damich having refused to attest to abide by his oath of office dismissed case 1:15-cv-01344EJD with reasonless summary judgment. As of March 25th that writ has not been docketed on the courts docket. It should be a clear sign of a lack of independence and integrity by the U.S. 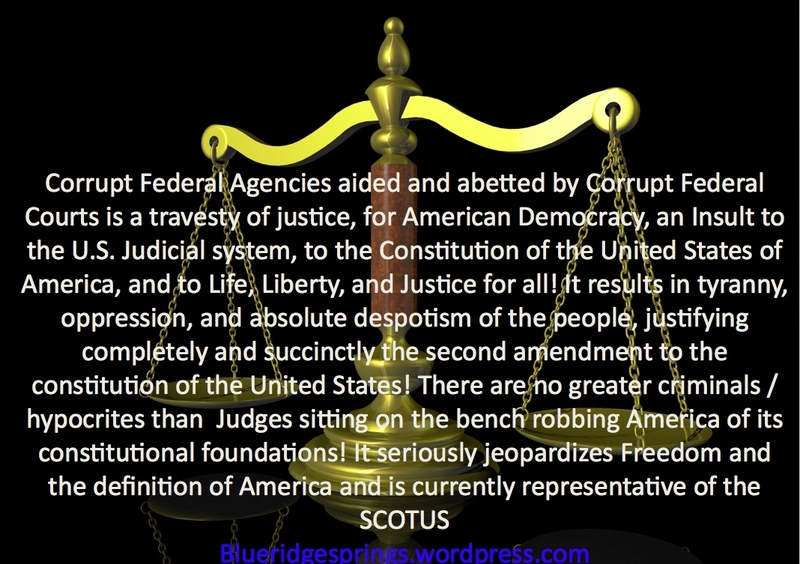 Judicial Court system for America to know; Chief Judge Sharon Prost of the Court of Appeals in the Federal Circuit was Judicial Council for the Senate Judiciary Committee of Joe Biden at the time of this racketeering enterprise legislation, passage, and at the same time Judge Edward J. Damich was likely designing it. Update- 6-13-2017 The writ of Mandamus was converted by the court of appeals to a request for appeal. This criminal maneuver eliminated my case form ever having a fair an unbiased hearing all the more so as the appeal was assigned to none other than Chief Judge Sharon Prost. America has a serious problem with the good ole boy network of the ABA, in American politics, legislature, courts,even the Presidents cabinet. 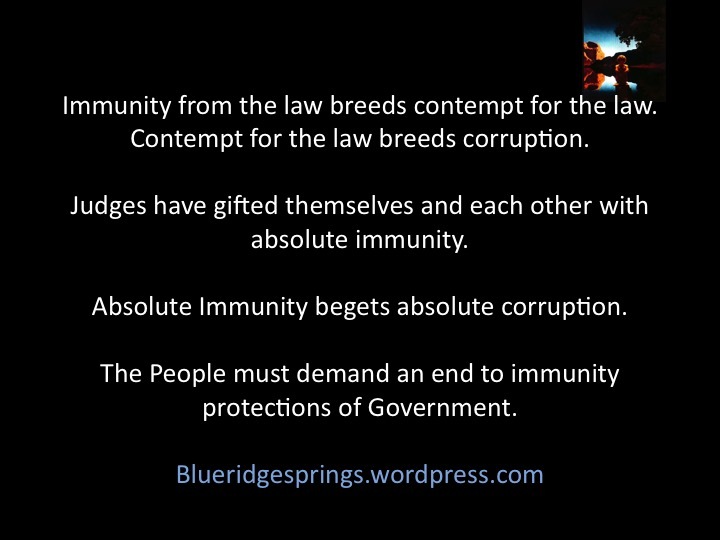 The biggest problem of all is when they choose not to abide by the law abusing immunity and allowing the corps to protect itself. The rule of law is defined as not based on the decisions of Government officials. This nation has become the subjects of tyranny and oppression at the hands of a criminal, treasonous, and corrupt Federal Judiciary. I’m all for save the planet initiatives BUT, not at the expense of treason on the people, and the Constitution of the United States of America! This Criminal Enterprise raped, robbed, and tortured my mother, my wife, myself, my daughter, countless others ands taken property without due process in a country where the constitution “The Supreme Law Says in ” The Fifth Amendment and Fourteenth Amendment to the United States Constitution that governments cannot deprive any person of “life, liberty, or property” without due process of law. These atrocious crimes will continue unless their somehow stopped.The very reason I attempted to accept the job of prosecutor. America where do the people turn when the President, Congress, Senate, and the Judiciary of a Nation support treason, warring against the constitution of the United States,and their sworn duties, to We The People? This was and is government working in its own interest against the society its paid to serve. I truly believe this is why the GOP is declining even to vet a new Supreme Court justice and while a green, left, liberal, progressive conservationist I support the GOP on this! Update 6-17-2017 Note the GOP chose to take the Nuclear option to put judge Neil Gorsuch on the bench as a replacemnet to Anton Scalia. The Agricultural Reorganization Act of 1994, signed into law by William Jefferson Clinton was the greatest act of treason by traitors to the Constitution of the United States to occur in the 240 year history of the Constitution! And Al Gore Called it: A model for Government Agencies cited for its efficiency” by Gore in his national performance review, “creating a government that works better and cost less. “ Thats a Government working better for its own self interest and not We The People! I’m sorry America but Treason is Treason and what these traitors have done tortures and terrorizes Americans, its devastation to American lives far exceeds the act to protect their freedoms by Edward Snowden. What a bunch of hypocrites! ! ! 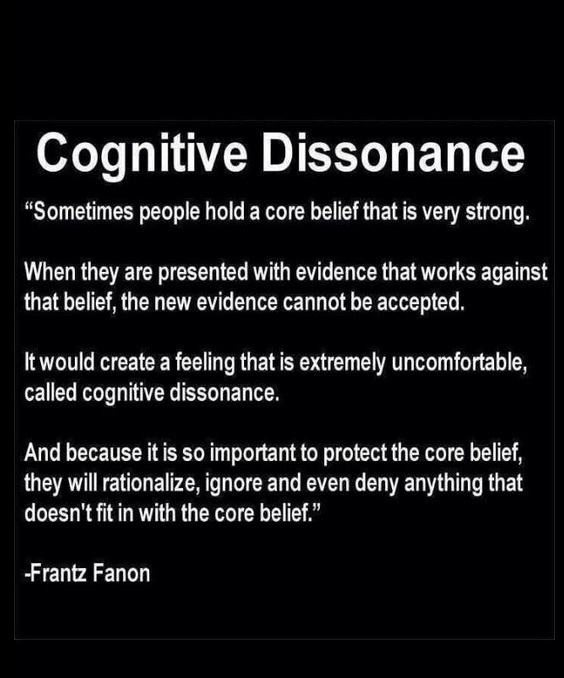 I cannot imagine the cognitive dissonance or ridicule this letter could face. However, All I ever asked was for my day in a court of law before a jury of my piers to make my case. It has been repeatedly denied. Do not prosecute me without granting me my right to a Jury Trial! America should demand the Government stand trial before a jury for running a criminal enterprise from the executive offices of the President!. No one is above the law (REALLY) ? Only We The People working together can escape tyranny and oppression and move a country forward. These representatives have shamefully set us back more than 200 years! America we need honesty, integrity, responsibility and accountability. We need a real revolution for a generation of WE not ME. 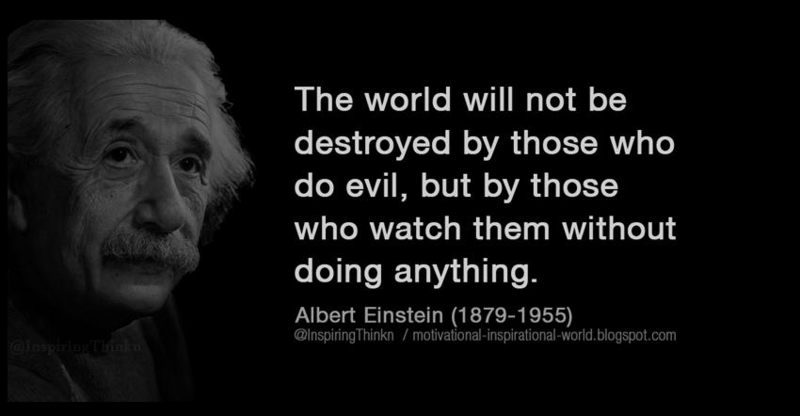 I know many ways our Government could be operating better. So many ways we could be focused on a greener cleaner future. I’ve often considered running for office. However, I could not withstand the frustration of dealing with so many obstructionist, focused on the I and me’s to envision and work for a world for We. No only as dictator of the world could the true potential of a world for we be obtained. But theirs only one dictator suited for such a job and that dictator is “We The People” wake up, stand up hold them accountable and responsible for their actions that means YOU you are We The People! The baby boom generation is still in power. Look at the mess they’ve made! These are despicable, hypocritical, narcissistic psychopaths ruining the world kick them out on their asses and put those who perpetrated treason in hell. Please choose a new President very carefully! Update 6-17-2017 – America you did not heed my warning and elected Donald Trump. Please! 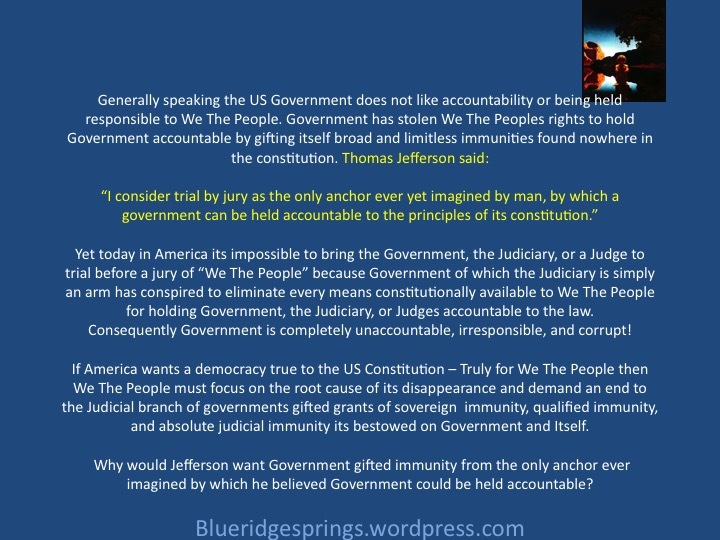 Demand an end to the immunities our constitution never mentioned that we may hold tyranny and oppression at bay. 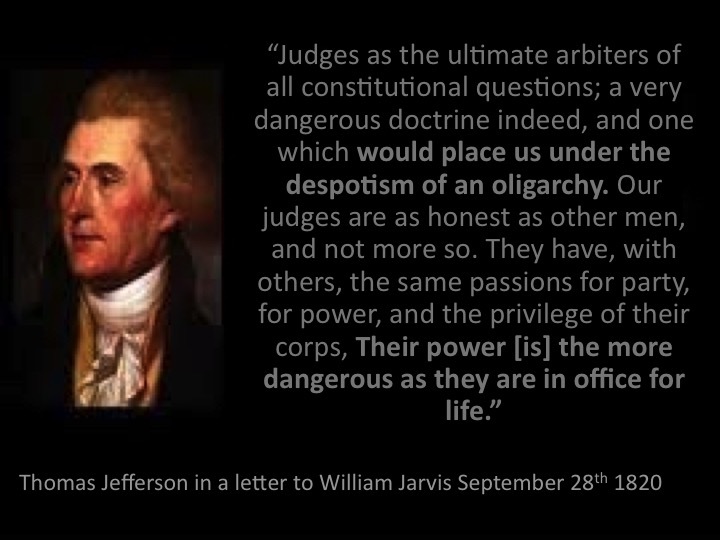 Please demand the Grand Jury return from the ashes to protect us form judges who succumb as Thomas Jefferson warned to the passions for party, for power, and the privilege of the corp. I truly believe the ABA has become King of despotic tyranny.